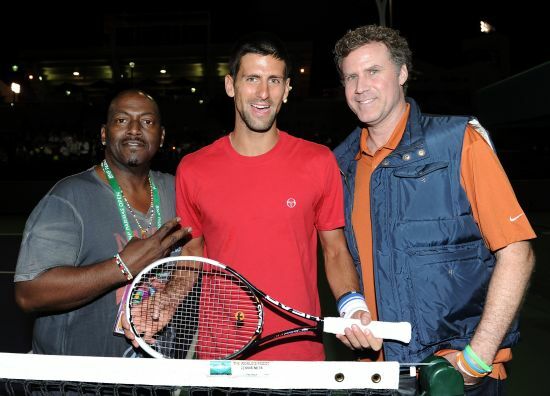 Over the weekend actor Will Ferrell and television personality Randy Jackson met up with Novak Djokovic before his practice during the BNP Paribas Open at the Indian Wells Tennis Garden. As expected, the big boys were spotted goofing around on court. Ferrell also brought along his son Magnus to meet the Serbian tennis star. Whether you want to pass ccnp wireless exams or looking for 70-640 certifications, our 000-106 can provide guaranteed success in real exam of testking ccia, 350-030 dumps are also having unique sense. I hope it's not too late for me to express my sadness over the biggest earthquake that triggered a monstrous tsunami waves that washed away the coastal towns in Japan last week. Very quickly I would think of Japanese pro tennis player Kei Nishikori. According to Nishikori, he couldn't help but think of the devastating news as he played his opening match againts Igor Andreev at the BNP Paribas Open, Indian Wells on Friday. "I was shocked yesterday and today, but I had to concentrate on my game,' said Nishikori who lost 6-4, 6-7 (2/7), 6-4." The 20-year-old Nishikori wore a black ribbon on his chest in honour of those who who died in the devastation. He said his heart goes out to those who lost loved ones and their livelihoods. "(Earthquakes) happen a lot in Japan especially," he said. "I knew it was going to happen sometime in a hundred years, but I didn't know it's going to happen like soon, like yesterday. Suddenly it came and so I don't think everybody was ready." Nishikori's hometown of Shimane is in south-west Japan and far from the centre of the earthquake which struck off the northeast coast. Shimane is a one hour flight to Sendai which was the hardest hit area. As soon has he heard the news he phoned his family and friends back home. "At least they are fine. My family is okay," he said. "I talked to them this morning. My town was okay. It wasn't too bad. But, you know, around Tokyo and others it's bad."